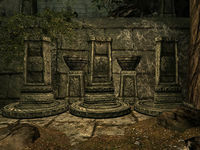 Puzzles are found in a variety of dungeons in Skyrim and Solstheim, most commonly Dwarven and Nordic ruins. Most puzzles require you to find the correct arrangement of totem symbols (bear, dragon, eagle, fox, moth, owl, snake, whale, and wolf) using nearby clues, riddles found in books, or carvings found on dragon claws. Others will require you to enter a correct sequence using buttons or kinetic resonators. Description: These large, ornate doors feature three rotating rings with carved totem symbols. 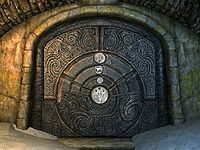 The doors are found in Nordic ruins, at the end of a wide hallway decorated with carved murals. Activating the rings on the door causes them to rotate, showing the next symbol. Solution: The rings must be turned so that the correct sequence of totems is displayed. When the corresponding dragon claw is inserted into the slot on the door, the door will open, allowing passage into the next area. Notes: The correct sequence of symbols can be seen on each dragon claw when viewed in your inventory. Nine different totem symbols appear on dragon claw puzzle doors: Bear, Dragon, Eagle, Fox, Moth, Owl, Snake, Whale, and Wolf. Each individual door is opened by a specific dragon claw, usually found in an earlier area in the same dungeon or given to you by an NPC. Some doors may be trapped, so be prepared to move out of the way in case you have solved the puzzle incorrectly. Description: Three rounded stones are found in a staggered row in front of a portcullis gate. The stones glow red and making a chiming noise when you stand close to them. When all three stones are active, the portcullis opens for a few seconds. Solution: You must use the Whirlwind Sprint shout to move quickly enough to pass under the portcullis before it closes. Notes: This puzzle only needs to be completed once; as soon as you have passed through successfully, the gate will remain open. Timing your run past these stones can be tricky. You will likely need to sprint past the stones, then use Whirlwind Sprint to move under the portcullis. If you fail to pass under the portcullis gate before it slams shut, the puzzle will reset and you will have to try again. Description: You will see four small blue orbs set in paddle-like extensions on a metal pole. The orbs will spin around the pole when activated. Solution: Activating the orbs on the paddles will activate the resonator. When several kinetic resonators are combined into a tonal lock, the resonators must be activated in the correct order to solve the puzzle and open the corresponding gate. Notes: This puzzle only needs to be solved once; the gate will remain open after you complete it the first time. 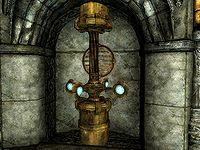 Pay close attention to any clues you are given when solving tonal locks; activating the resonators in the wrong order may set off a trap or may cause one or more Dwarven automatons to attack. When the incorrect solution is entered, the puzzle will reset, allowing you to try again. Description: You will see a few braziers on what appears to be a large, circular, maze-like track carved into the ground. When the puzzle is started, a line of purple flames will fill the track up to the first brazier. Solution: You must push each brazier so that the purple flame is carried along the track and forms a circuit. Notes: If the flames do not progress after you have moved a brazier, move it to another position and try again. Found only in Dimhollow Cavern during the quest Awakening, this puzzle requires you to form a circuit of the purple flames on the floor. The puzzle is activated by pressing the button in the center of the large round platform. Once the flames have appeared, you can activate the braziers to push them along the track. There are no traps associated with this puzzle, so if you tried a movement that did not work, simply push the brazier to another position on the track until more of the purple flames appear on the track. Description: You will see waist-high stone pillars (usually in groups of three or more); the pillars have three faces, each carved with an animal totem. When the pillar is activated, it will rotate to show the next face. Solution: Each pillar in the area must be rotated so that the correct series of symbols is showing. 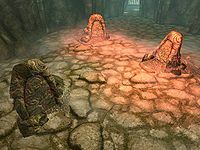 When the pillars are turned correctly, you can usually activate a nearby switch in order to open a gate, lower a bridge, or activate another element of the dungeon. Notes: Pay attention to other pillars in the area; in some puzzles, rotating one pillar will cause the others to rotate as well. A very common sight in Nordic ruins, these pillars feature three totem symbols: Eagle, Snake, and Whale. 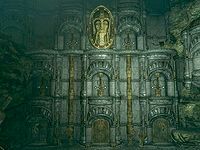 It is usually easy to deduce which symbols must be showing on the pillars to complete the puzzle (there are often corresponding carvings on nearby walls or statues, or clues in a journal related to the dungeon). The pillars are typically set in alcoves and must be turned so the correct symbol faces outward. Some are located in more open areas, however, so if you are unsure which way the correct symbol must be facing on the pillar, check the base of the pillar for a triangular arrow and make sure the symbol you want is facing that arrow. Pillar puzzles are often trapped; after you have attempted to solve the puzzle, look around the room for trap sources (such as holes for darts or spears) before activating the corresponding switch. If you have entered the wrong solution, avoid any traps that fire and try again. The book The Dragon War refers to the bird symbol as Hawk rather than Eagle. 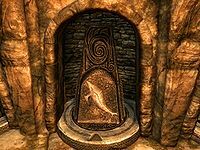 The books Of Fjori and Holgeir and Notes on Yngol Barrow have clues to the deciphering of Stone Totem puzzles in certain locations. Save and then immediately load that save. Load either the auto-save from the entrance, or a save from before you entered. Exit the location, save, and load that save. "Reset" the door by selecting the right combination and try the claw, then turn each ring once and try the claw again. Do this until the correct combination re-appears and try again. Type tcl into the Console to clip through the door. Reenter the code once past. Note that unlock will not work. Clear the hard drive cache. This page was last modified on 22 March 2019, at 19:31.